I remember growing up in the church our family attended and hearing hundreds of sermons on various topics. Our pastor was old-school, a true servant, the type of man who visited every single person on the sick-and-shut-in list weekly. I admired him as a man because he had integrity and he was confident in who God was and he never wavered. Out of all the sermons he preached I can vividly remember him preaching about having faith the size of a mustard seed, referencing the text in Luke 17:6. What stood out to me was that towards the end of his sermon, the ushers literally handed out mustard seeds to everyone in the congregation. For the next few months after this sermon, there was always a bowl of leftover mustard seeds in the back of the church on top of a shelf. We had a brother who attended our church who had special needs and I remember following him out one day after service. As we passed that shelf he stopped, turned around and made this face as if to say, “I need a reminder”, and he grabbed a single mustard seed from the bowl. At the age of 13 or 14 it didn’t mean much to me then but as I reflect on my life and the lives of those around me, it speaks volumes. 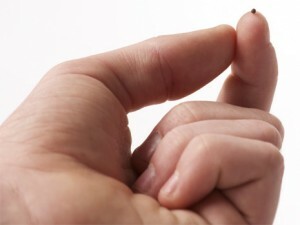 To put this in context, check out the picture below to get a frame of reference of the size of a mustard seed. What my pastor was trying to convey is just what the scriptures are trying to convey; not that you only need a “little” bit of faith, but rather, faith in GOD, in any amount, is powerful to move mountains. Let me back track here. As a Sunior (Soon to be Junior, depending on credits) at Temple University, I, along with a few brothers ran a bible study on campus in conjunction with our campus choir, “Voices”. We started every semester with a teaching on faith because I (we) felt that it was that essential and often times, an easily forgotten “concept”. Allow me a moment to digress and share some highlights of that study. Our initial study of faith started with the term, which in the Greek is “pistis”, simply meaning to have “conviction of the truth”. We learned that the term faith, in and of itself, does not necessarily have to have a spiritual connotation. One of our favorite examples of faith is the fact that we breathe without hesitation, it’s automatic and we simply trust that there is sufficient oxygen in the air for our lungs to contract. In like manner, most people do not hesitate when they go to sit down on a chair. We simply trust that the chair will hold our weight and we sit, freely. In the same manner, our faith or conviction of the truth of GOD’s word should be automatic. We should trust GOD’s word freely without apprehension or doubt but this is often a struggle. Why? In Hebrews 11:1, a clear and concise description of faith is given. “Now faith is the substance of things hoped for, the evidence of things not seen.” Remember that faith is the conviction of truth. “Substance” (hupostasis in the Greek) refers to an under setting, foundation, or substructure. Hoped for (elegchos in the Greek) means the proof, evidence or conviction of a thing. Now, inserting these definitions the verse reads as follows: Now the conviction of the truth, is the FOUNDATION or SUBSTRUCTURE of things hoped for (in Christ), the PROOF/EVIDENCE of those things you cannot see. Why is this important? Well, it teaches us that faith in God’s word (mustard seed size and all) is both the foundation of AND the evidence of who GOD says He is. All too often, in our microwave, fast-paced, social-media driven society, we are tempted to walk by what we see, as our evidence, rather than functioning in faith. Our minds are whisked away by the things we are told, by the conditions of life, and the opinions of others. But faith, real genuine faith in Jesus Christ allows us to truly live above the turbulence of our circumstances. Genesis 22: 1 – 14 describes the story of Abraham, who, being commanded by GOD, left his homeland to travel to the land of Moriah, to offer his son Isaac as a sacrifice. As the passage continues it describes Abraham, the very next morning, getting up and taking his son Isaac on this journey. This is an example of faith. Abraham was persuaded or convinced that GOD, who had established conditions for sacrifice back in Genesis 3, would not allow Abraham to sacrifice his son. So, Abraham, not knowing the full plan, responded in faith and obeyed GOD’s command. During the journey, scripture tells us that Abraham’s servants stayed behind with the animals, while he and Isaac journeyed up the mountain. Abraham also told the servants that he and Isaac would return after going to worship. Abraham was fully convinced that his son would be returning with him, despite the fact that GOD had told him to sacrifice him at Moriah. In fact, in verse 7, Isaac even says, “where is the lamb we are going to offer as a sacrifice” (probably confused) and Abraham responded, “GOD will provide.” In the final few verses (vs. 10-13) Abraham stretches forth his hand to slay his son, and an angel of the Lord appears in time to stop the act. In verse 13, God provides (as Abraham said, convincingly in verse 8), and Abraham offers up the ram as an offering and names the place Jehovah-Jireh. The literal translation of Jehovah-Jireh is usually said to be “God our provider”, but the Hebrew more accurately defines it as “God sees” or “God has seen.” Remember our definition of faith? The evidence (foundation) of things hoped for and the proof of things not seen. Genesis 22 shows us that faith is powerful because it is GOD who already sees His provision, His plan, the fulfillment of His promise. All we need to do is to exercise our faith. This story of Abraham is a powerful example of what faith in GOD can do when you are convinced of the truth of GOD’s word. Sometimes we read these stories and we think, well, I’m not Abraham and therefore, you can’t expect me to have that type of faith. But remember, this is mustard seed faith. It moves mountains. The critical issue to exercising this type of faith is knowing what your faith is built upon. See, we can’t say we have conviction of the truth, if we don’t know the truth. So, in order for us to respond in faith, we do have to be about the business of spending time in our word. I don’t say this as an indictment against anyone. I struggle just as much as anyone else prioritizing my time in GOD’s word and my faith, at times, is weakened as a result because I forget what my faith if founded upon. What made Abraham an amazing example was his response to GOD’s spoken word (go to Moriah). Like Abraham, we have access to GOD’s word and we have a responsibility, as believers, to take seriously the notion of spending time reading and meditating on it. As I reflect on what is written and shared here I have to acknowledge a few things. No one is perfect and faith is like a muscle. It gets stronger as we use and exercise it. It’s a lot easier to write about faith than to act it out, practically. I recognize that my faith is a direct reflection of my personal devotional life in Christ. When I am dialed in and spending time in GOD’s word, I find that my faith is not easily shaken. I am less impacted by the day-to-day things that tend to increase my stress levels. As a high school assistant principal, there are times when my faith is so weak, due to a lack of exercise, that the smallest thing can drive me over the edge. I’ve lost my cool, used inappropriate language in my office or in front of colleagues, or acted in a manner that does not reflect Christ. All because I allowed a situation (what I saw and heard) to grossly impact my ability to respond with confidence in who Jesus is and who I am, in him. Have you ever had experiences like these? Where circumstances dictate your “happiness” or joy? When you can hear one thing that completely changes the trajectory of your day or week? I mean think about it: how connected was Abraham to the heart of GOD that he could be told to go to a foreign land to sacrifice his son, and he went without blinking an eye? We get bent out of shape when we have to move out of the way for an ambulance to pass us on the road, let alone taking a 3-day journey to kill our own child. My point? It’s simple, GOD wants us to have the type of faith, in Him, where we trust Him with our everything. Not trusting Him with what we are comfortable with, but with our everything. Because, like Abraham, GOD sees the outcome of your situation, even if you have no clue as to where you’re headed. My hope and prayer is that you will take me up on this challenge to increase your devotional time in GOD’s word and over time reflect on how your faith in GOD, has been impacted by that devotion. ← A Time to Man Up!